Of course, the kids were most eager to read Winnie-the-Pooh because of Disney. This probably annoys some people but not me because I like Disney no matter what people say. (Except I also do not like Brave and/or Frozen no matter what people say.) I did not read Winnie-the-Pooh -the-book before watching Winnie-the-Pooh-the-movie, nor did my children. In this case, I don't think that hurt us very much and I'm not going to live with regrets. We enjoy both book and movie equally (in this case) so it's all good. 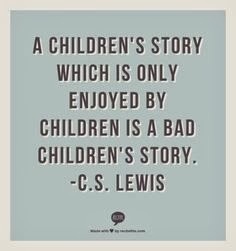 Instead of talking about the story itself (which, if you've seen the movie, you pretty much know it!). Instead I must tell you of our experience. 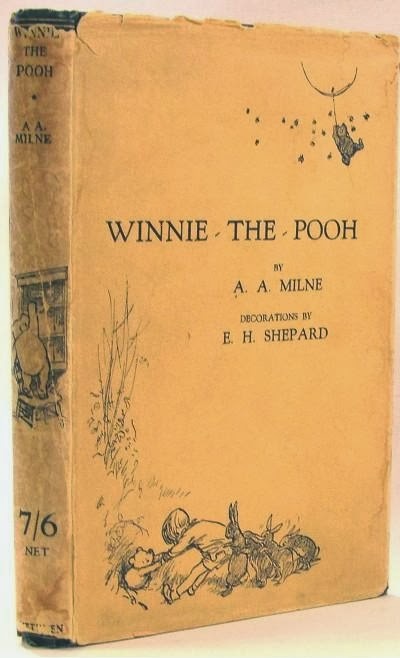 Mommy - I had forgotten how witty A.A. Milne was. Really, really witty. I laughed outloud several times while reading this. Bookworm3 (age 2) - Doesn't really like sitting still and reading chapter books but did so for a good portion of this particular read-aloud. That is likely due to the fact that she is familiar with the character names and we sang the Disney theme song several times before and after we completed various chapters. She does like music very much! Bookworm2 (age 5) - Was the most excited to read this book and enjoyed every page. He had some full belly laughs, especially during the chapter "In Which Christopher Robin Leads an Expotition to the North Pole." Bookworm1 (age 7) - Laughed very hard and very often. He finally caught on to the fact that Owl kan't spel and giggled hard each time Owl tried. The humor of Milne was not so elusive to my seven year old and he enjoyed the read despite himself. He caught on to the childish humor in ways that the other two didn't. For example, when Roo escapes the pools underneath the waterfall and runs around asking each animal - individually - "Did you see me swim?! Did you see me swim!?" Bookworm1 laughed very hard. Now that he has aged to a greater point of maturity (ha ha), he can watch his younger siblings doing the same things and in the same manner as Roo does, bringing about a more pleasurable and funny reading experience. Life experience does help out when reading some books, most certainly! Yes, this is a delightful, funny, humorous, classic tale that is not to be missed. I'm glad I put it away until they were more ready to appreciate it, instead of plowing through it a year ago. Patience was a virtue in this case (as in most cases, but let's not dwell too hard on that at present!) and I, personally, delighted in the read. It's fun to share stories with people who are so clearly enjoying the tale and themselves in the process. To say I LOVED reading this book to my kids doesn't quite take it far enough. Really, the pleasure was all mine! I love it, too, and I REALLY need to re-read it with my children. I hope you'll link this up for the March RAT! I haven't read this books in years, but I've got them around here somewhere. This review makes me want to pull them out and give them a reread. I got the whole set of these books when our semi-local Books-A-Million went out of business. I realized quickly that my little ones weren't quite ready. We've read some of the poetry, but I'm looking forward to reading this one to them! I think I may have read this book but not the others. I think I remember my kids not being too into it, but I think they were too old by the time we got to it. When they were little, though, they loved the four classic Disney videos, plus there was a weekly cartoon of the Pooh characters that we have several videos of. So much better quality in both story and animation than cartoons today. I read this book... last year? and rather enjoyed it. It's one I hope our kiddos will appreciate!